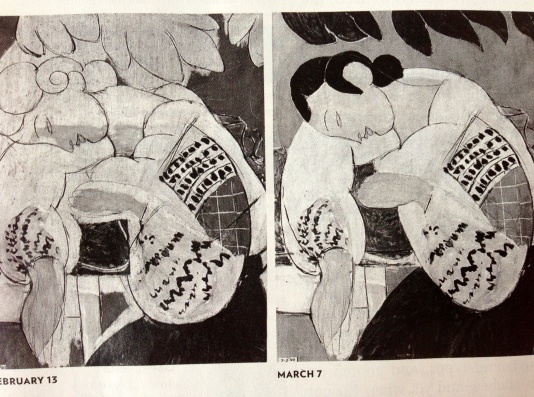 Speaking of Matisse, it’s worth noting that while he was nothing if not original, he didn’t disdain those old-time pictorial devices. 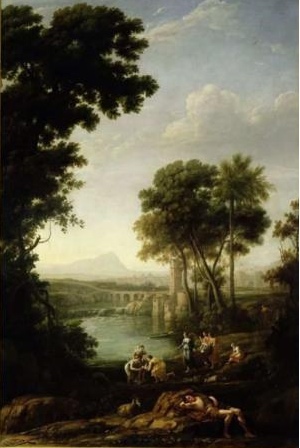 In “Luxe, Calme, et Volupte” his composition is based on the foreground oblique (a diagonal receding into space), and effective use of haloing. Haloing involves pushing the contrast between an object (e.g., a figure) and its immediate background. 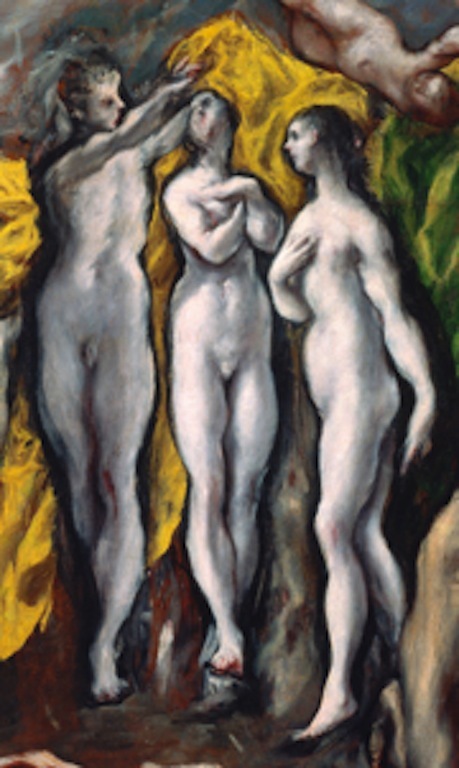 Simply setting a light figure, for example, against a dark background, as in the Tintoretto below, works if the composition is variable enough to provide contrast where it’s needed, but in “Luxe” Matisse is going for all-over brightness, and needs to be more direct. When contrast doesn’t work, or is just too fussy, a fallback device is haloing–just surrounding a shape with a strong contrast. El Greco employs it very forthrightly in the detail to the left. The blacks around the figures are more than outlines, but they don’t describe forms, as Tintoretto’s do. They describe psychological space, if you will–they focus us on the figures so strongly that the background simply doesn’t count. 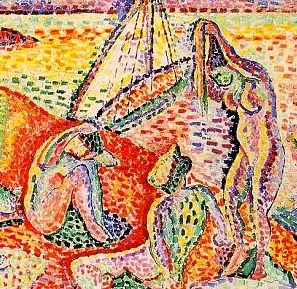 Matisse goes at it in the same way, although even more abstractly, with red surrounding the recumbent figures, and blue along the belly of the standing woman. The red reads as a concentration of colors in the ground; the blue has no logic except compositional convenience, but there it scores both in its boldness in describing the figure and in rhyming blues elsewhere. One of the unexpected delights of the recent Matisse show at the Met was “Sculpture and Vase of Ivy.” I’d never seen it before. The surfaces and layers of paint are fascinating in the Matisse-y way, which is only partially evident in reproduction (hasten to the Tikanoja Museum in Vaasa, Finland to see it in the flesh). There is a lot of pink underpainting that gets covered over more or less in blue, but peeks through in a lively way. 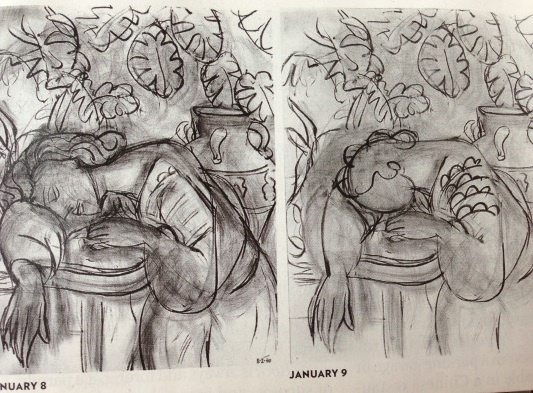 Having decided on the blue, Matisse doesn’t lay in a smooth, consistent layer, but piles it on and leaves it rough. 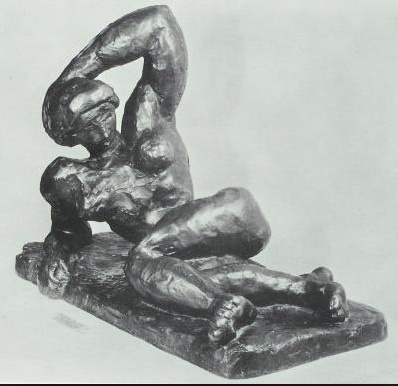 Easier to discuss here is the relation between the painting and the sculpture it is based on (below). He isn’t just copying. 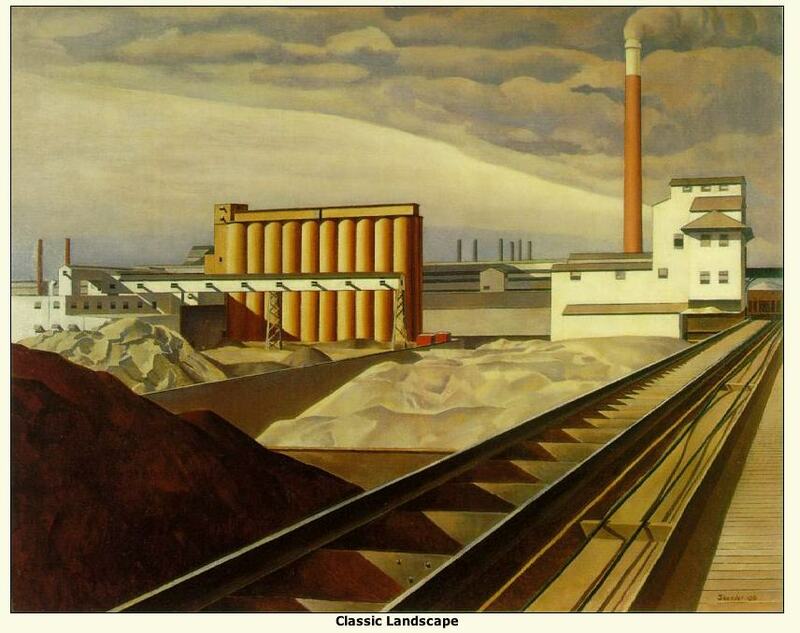 The painting simplifies but also varies every detail. The thigh is far larger and more prominent; the rest of the figure is flattened and greatly simplified (her left arm, her head, the shape of her torso) and darker in tone. Oddly, her right arm, which in the sculpture is jammed back, has an altogether more natural and comfortable shape in the painting. 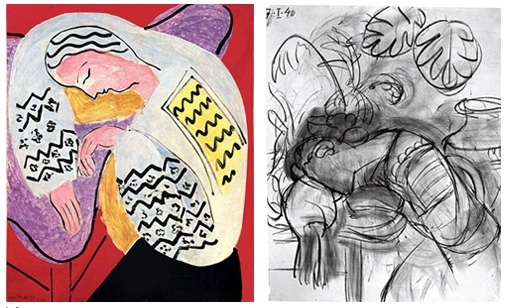 Matisse’s freedom in matters of detail, proportion, and everything else is especially clear if we compare his pieces with, for example, Goya’s more conventional approach in these matters. Returning to the painting, there is the odd matter of the two vertical stripes on the left. They aren’t descriptive (of a doorway or window, for example); they’re just stripes. 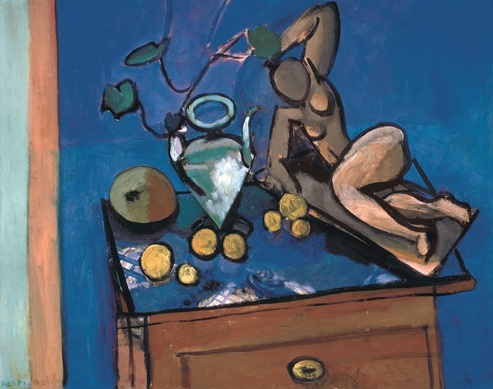 They repeat the bright tones of the thigh and the rim of the vase, which would otherwise be overwhelmed by the darkness and intensity of the blue surround; they brighten the whole; but those are matters Matisse could have addressed directly by tonal adjustments. What they really accomplish is to emphasize the abstract, decorative nature of the piece. They rescue it from being simply a “view” of a still-life. What constitutes a dud depends, of course, on what interests you. 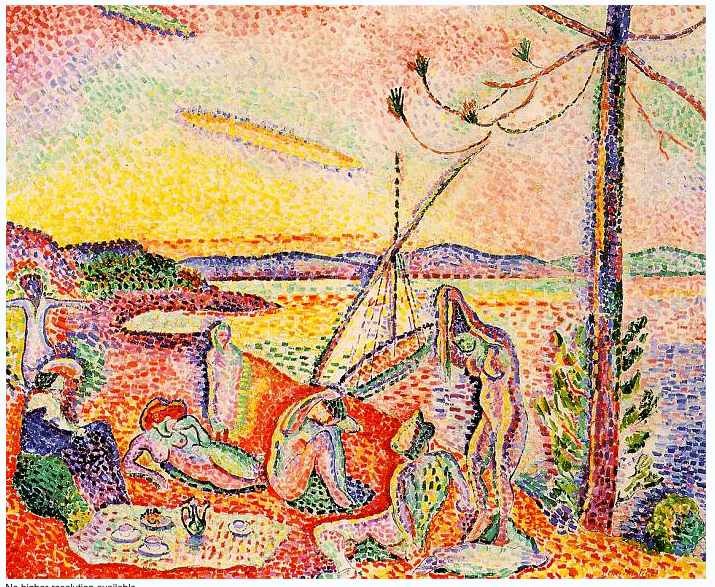 What interests me about Matisse’s best work is the sense of risk, exploration, happy accident, and bold resolution. To my eye, “The Dream” is pushed past that dynamic state into a pale and sterile over-refinement. The earlier stabs at the piece, which were photographed as the work progressed, and five of which are included here, are all much more lively and engaging. As an art student in the ’20s, the late Erle Loran lived in Cezanne’s studio, and went about the countryside taking photos of the motifs Cezanne had painted years before. 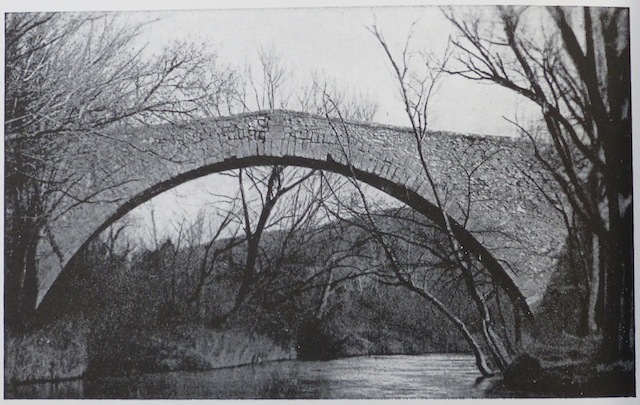 Later he wrote Cezanne’s Composition: Analysis of his form with diagrams and photographs of his motifs. * It’s a difficult and tedious book; I recommend it highly. It offers real insights into how a great artist transformed what was in front of him into art, with the caveat that it is more in the nature of a resource than an authority. In the face of his subjects Cezanne was the boss, and to my eye, Loran doesn’t always catch his train of thought. But these are quibbles. Loran secured information nobody else did, and now we can toy with it at our leisure. 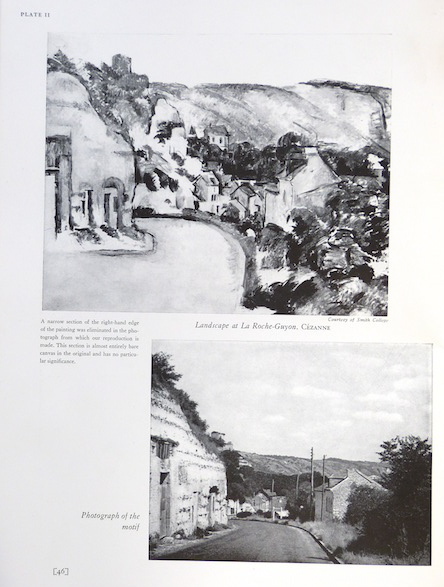 The meat of the book consists of pages like the one to the right, where Loran matches a painting with his snapshot of what Cezanne was looking at. More or less. In this case, Loran was standing in the middle of the road, while Cezanne, as you can see from the painting, set up his easel on the margin, and more directly opposite the building to the left. We can see that both by the flat-on angle of the building, and because if we go a few steps down the road a good deal of the village and the castle on the hill, almost hidden in the photo, come into view. Loran seems to have taken his snap from the spot where things looked most like the painting, but Cezanne probably worked in two or three different places where he could see whatever bits served whatever part of the composition he was after at the moment. Time, of course, had altered Cezanne’s motif by the time Loran got to it. Notably, the road had been paved, which is why the photo is predominantly middle tones, while Cezanne’s view, looking at stone and dirt, was predominantly light. That was the foundation of his composition. He developed a delicate range of light tones fading here and there into middle ones, with small, sharp darks here and there for spark. 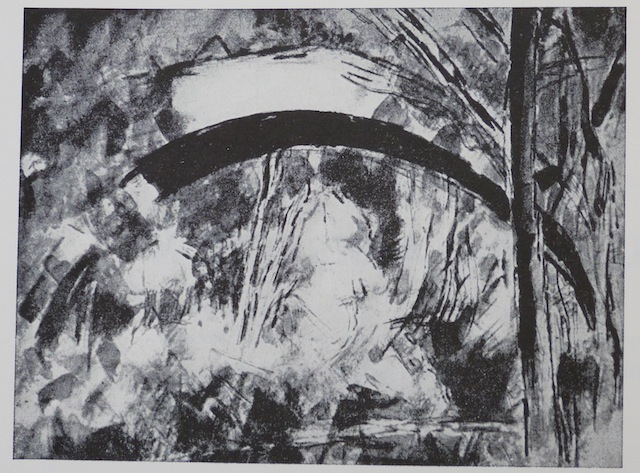 The road was a more interesting shape before it was filled and paved, coming straight at us before turning, as he shows it: in the painting we see more ground at the base of the wall. 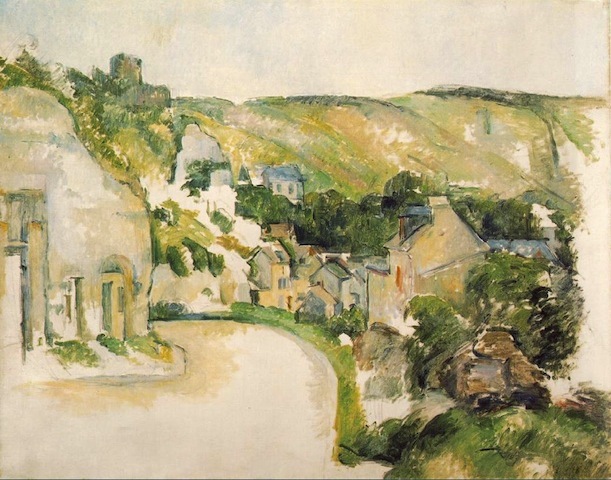 He pressed the white foreground into the far hills so that we have flat and simple building/road in one corner, greatly neared and elevated hills in the other, and textured village as a diagonal line between.The piece is unfinished–see the right side, and bits in the middle. It’s a late piece; he died in 1906. Presumably he would have pushed it on. Time had overtaken many of Cezanne’s motifs before Loran photographed them. Trees grew, bushes disappeared, buildings came and went. Even so there are several fascinating cases in which essential forms and perspectives are present, and you can see how the artist pushed and pulled to get what he wanted. 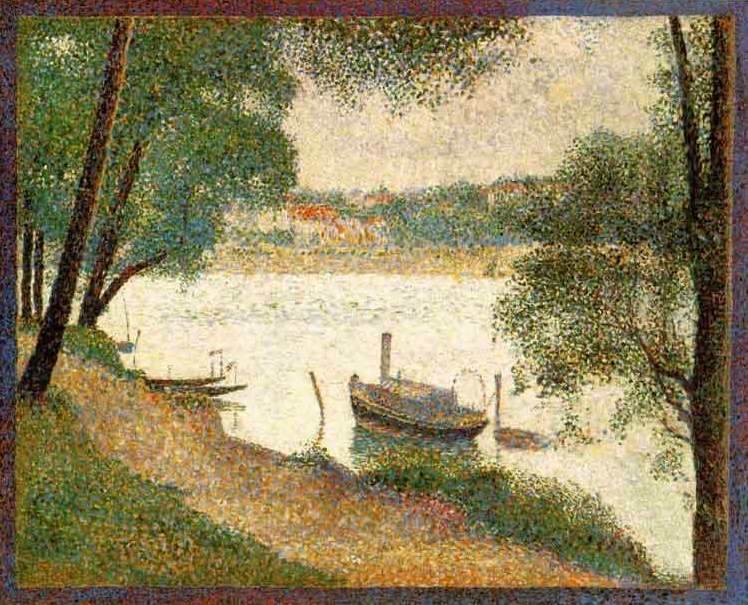 In the example below, a watercolor, he has dissolved the sturdy subject into a salad of brushstrokes, one here, one there, until stone and trees, dark and light and air all share a common solidity. Cezanne’s Composition Erle Loran University of California Press — written in 1943, updated many times, still available. The b&w images in this post are lifted from the book. 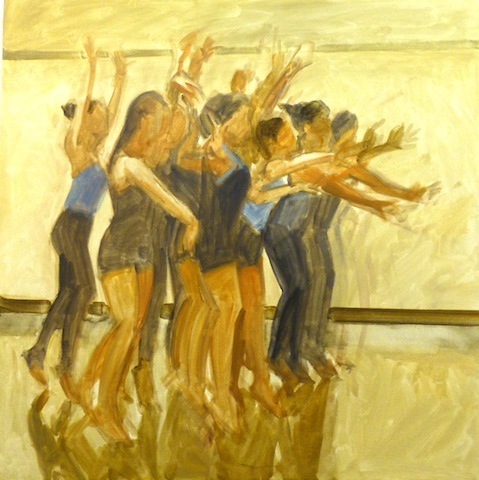 Occasionally I sit in on an a dance class to draw the figure in motion. One day the piece in process climaxed in a willowy cluster of legs on tiptoe supporting a dense mass of torsos topped by a flurry of faces, arms, and hands. This looked like a painting. I brought a camera next time, and took several photos, including the one below. A 24″ square canvas seemed about right. 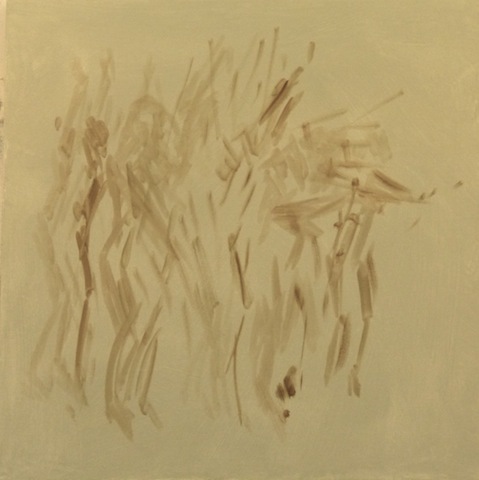 The first pass takes about ten minutes; it roughs in the shape of the group and how it will drive against the edges of the canvas. This sense of action is the basis of the piece, and determines everything that follows. The second pass comes a day or two later, when the first is dry, and takes half an hour. Here the principal shapes are roughed in. Baseboard and wall molding suggest the space widening as the dancers advance. The third pass, after another day or two, takes an hour. It blocks in the mass of the group and indicates color. The fourth pass firms up detail decisions about shapes and tones. But there are problems. The biggest of these is that the group floats indecisively in the space. The most direct solution is to reduce the canvas from 24 x 24 to 22 x 22, taking the excess mostly from the top and right side. 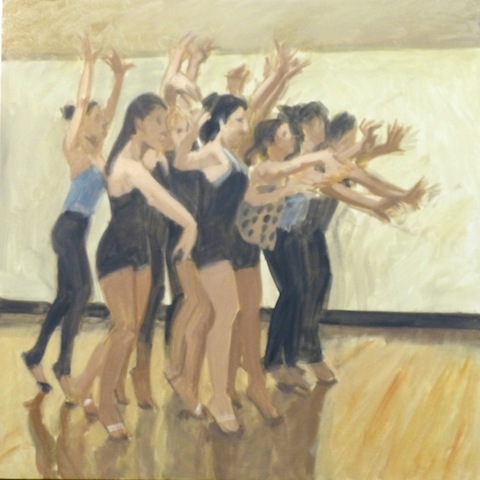 This will bring the hands and arms closer to the edges and energize the negative space around the group. Finishing takes the better part of a morning. It can be handled pretty freely because most of the compositional decisions have already been made. It’s largely focused on color, firming up shapes, and strengthening contrasts. 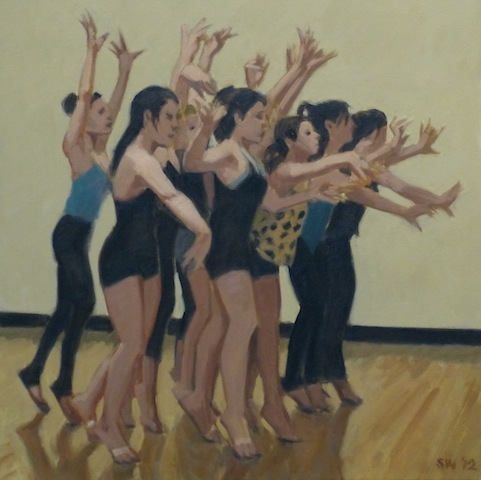 Limiting the flesh tones to light, medium, and dark, and the blacks to a deep off-black and black, makes the masses of bodies and limbs more coherent. 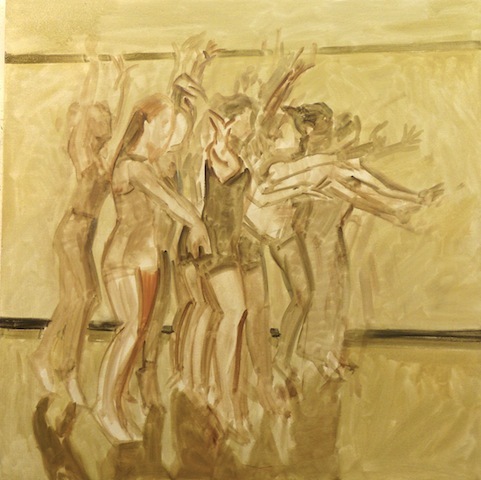 Getting rid of the ceiling and firming up the tone and color of wall and floor emphasizes the negative spaces between the figures, and the gestures of the hands and feet.